This sleeveless tee has the broken-in charm of that cherished concert shirt you DIY'ed back in the day, but with a loose and flowy fit perfected for your shape. 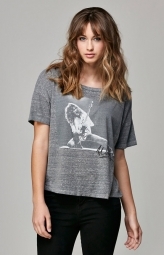 The super soft fabric and a slightly sporty silhouette make this tee a go-to for lounging or wearing out. 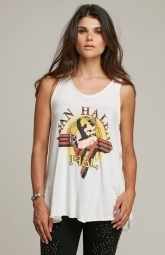 Distressed 1978 Eddie Van Halen design on the front. So cool! COLOR: Coal/Grey Pigment. Garment dyed. REGULAR FIT. Order your regular size. If in between sizes, order up.